Natural gas is widely considered to be an environmentally cleaner fuel than coal because it does not produce detrimental by-products such as sulfur, mercury, ash and particulates and because it provides twice the energy per unit of weight with half the carbon footprint during combustion. These points are not in dispute. 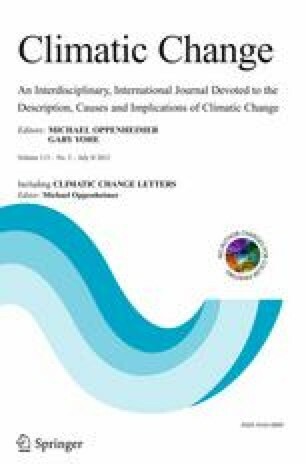 However, in their recent publication in Climatic Change Letters, Howarth et al. (2011) report that their life-cycle evaluation of shale gas drilling suggests that shale gas has a larger GHG footprint than coal and that this larger footprint “undercuts the logic of its use as a bridging fuel over the coming decades”. We argue here that their analysis is seriously flawed in that they significantly overestimate the fugitive emissions associated with unconventional gas extraction, undervalue the contribution of “green technologies” to reducing those emissions to a level approaching that of conventional gas, base their comparison between gas and coal on heat rather than electricity generation (almost the sole use of coal), and assume a time interval over which to compute the relative climate impact of gas compared to coal that does not capture the contrast between the long residence time of CO2 and the short residence time of methane in the atmosphere. High leakage rates, a short methane GWP, and comparison in terms of heat content are the inappropriate bases upon which Howarth et al. ground their claim that gas could be twice as bad as coal in its greenhouse impact. Using more reasonable leakage rates and bases of comparison, shale gas has a GHG footprint that is half and perhaps a third that of coal. The online version of this article (doi: 10.1007/s10584-011-0333-0) contains supplementary material, which is available to authorized users. Natural gas is widely considered to be an environmentally cleaner fuel than coal because it does not produce detrimental by-products such as sulfur, mercury, ash and particulates and because it provides twice the energy per unit of weight with half the carbon footprint during combustion. These points are not in dispute. During the drilling, fracturing, and delivery processes, 3.6–7.9% of the methane from a shale gas well ends up, unburned, in the atmosphere. They claim that this is at least 30% and perhaps more than twice the methane emissions from a conventional gas well. The greenhouse gas footprint for shale gas is greater than that for conventional gas or oil when viewed on any time horizon. In fact, they state that compared with the greenhouse gas (GHG) emissions from coal, it is 20–100% greater on the 20-year horizon and is comparable over 100 years. They close with the assertion that: "The large GHG footprint of shale gas undercuts the logic of its use as a bridging fuel over the coming decades, if the goal is to reduce global warming." We argue here that the assumptions used by Howarth et al. are inappropriate and that their data, which the authors themselves characterize as “limited“, do not support their conclusions. Howarth et al.’s high end (7.9%) estimate of methane leakage from well drilling to gas delivery exceeds a reasonable estimate by about a factor of three and they document nothing that indicates that shale wells vent significantly more gas than conventional wells. The data they cite to support their contention that fugitive methane emissions from unconventional gas production is significantly greater than that from conventional gas production are actually estimates of gas emissions that were captured for sale. The authors implicitly assume that capture (or even flaring) is rare, and that the gas captured in the references they cite is normally vented directly into the atmosphere. There is nothing in their sources to support this assumption. The largest leakage rate they cite (for the Haynesville Shale) assumes, in addition, that flow tests and initial production rates provide a measure of the rate of gas release during well completion, drill out and flowback. In other words they assume that initial production statistics can be extrapolated back to the gas venting rates during the earlier periods of well completion and drill out. This is incompatible with the physics of shale gas production, the safety of drilling operations, and the fate of the gas that is actually indicated in their references. While their low-end estimate of total leakages from well drilling through delivery (3.6%) is consistent with the EPA (2011) methane leakage rate of ~2.2% of production, and consistent with previous estimates in peer reviewed studies, their high end estimate of 7.9% is unreasonably large and misleading. We discuss these issues at length below. Even though the authors allow that technical solutions exist to substantially reduce any leakage, many of which are rapidly being or have already been adopted by industry (EPA 2007, 2009), they seem to dismiss the importance of such technical improvements on the GHG footprint of shale gas. While the low end estimates they provide incorporate the potential impact of technical advances in reducing emissions from the sources common to both conventional and unconventional gas, they do not include the potential impact of “green technologies” on reducing losses from shale gas production. The references they cite document that the methane loss rate during completion of unconventional gas wells by modern techniques is, or could be, at least 10 times lower than the 1.9% they use for both their high end and low end estimates. Downplaying ongoing efforts and the opportunity to further reduce fugitive gas emissions in the natural gas industry, while at the same time citing technical improvements in the coal industry, gives a slanted assessment which minimizes the positive greenhouse potential of natural gas. Although the Howarth et al. agree "Methane emissions during the flow-back period in theory can be reduced by up to 90% through Reduced Emission Completions technologies or REC", they qualify this possibility by saying: "However, REC technologies require that pipelines to the well are in place prior to completion." This suggests that if the pipeline is not in place the methane would be vented to the atmosphere, which is misleading. If a sales pipeline is not available, the gas captured by REC technologies could be easily be (and are) flared and the GHG footprint thereby minimized. Howarth et al. justify the 20-year time horizon for their GHG comparison by simply stating that “we agree with Nisbet et al. (2000) that the 20-year horizon is critical, given the need to reduce global warming in coming decades”. But the point Nisbet et al. make in their meeting abstract is that “adoption of 20-year GWPs would substantially increase incentives for reducing methane from tropical deforestation and biomass burning”. Their concern is that the 100-year timeframe would not discourage such methane emissions enough. Everyone would agree that discouraging methane as well as CO2 emissions is desirable, but the Nisbet et al. abstract offers no support whatever for the adoption of a 20-year GWP timeframe when considering replacing CO2 emissions with CH4 emission by swapping coal for gas, and we strongly disagree that the 20 year horizon is the appropriate choice in this context. As Pierrehumbert (2011) explains, “Over the long term, CO2 accumulates in the atmosphere, like mercury in the body of a fish, whereas methane does not. For this reason, it is the CO2 emissions, and the CO2 emissions alone, that determine the climate that humanity will need to live with.” In the context of a discussion of the benefits of swapping gas for coal, a 20 year horizon hides the critical fact that the lifetime of CO2 in the atmosphere is far longer than that of methane. Any timeframe is artificial and imperfect in at least some contexts, but a 100 year timeframe at least captures some of the implications of the shorter lifetime of methane in the atmosphere that are important when considering swapping gas for coal. One could argue (although Howarth et al. do not) that the 20-year horizon is “critical” because of concern over triggering an irreversible tipping point such as glacial meltdown. However, if substituting gas for coal reduces (or could reduce) the GHG impact on a 20-year horizon as well as on a 100-year horizon, as we argue below is the case, substitution of gas for coal minimizes the tipping point risk as well. Most workers choose the 100 year timeframe. Hayhoe et al. (2002), for example, show that in the long, 100 year, timeframe but not on the short timeframe of 20 years or so, substitution of gas for coal reduces greenhouse warming. They consider the warming effects of decreasing SO2 and black carbon emissions as coal burning is reduced as well as the warming effects of CO2 and CH4 emissions, and they calculate greenhouse impact of various substitution scenarios over the next 100 years using a coupled atmosphere-ocean energy balance climate model. Their analysis avoids the arbitrariness of GWP factors. Although there are many considerations regarding the transition in the short term, their analysis shows the long term benefits of swapping gas for coal are completely missed by the 20 year GWP factor. Howarth et al. choose an end use for comparing GHG footprints that is inappropriate in the context of evaluating shale gas as a bridging fuel. Coal is used almost entirely to generate electricity, so comparison on the basis of heat content is irrelevant. Gas that is substituted for coal will of necessity be used to generate electricity since that is coal’s almost sole use. The appropriate comparison of gas to coal is thus in terms of electricity generation. The "bridge" is from coal-generated electricity to a low-carbon future source of electricity such as renewables or nuclear (EIA AEO 2011). Howarth et al. treat the end use of electricity almost as a footnote. They acknowledge in their electronic supplemental material that, if the final use is considered, “the ability to increase efficiency is probably greater for natural gas than for coal (Hayhoe et al. 2002), and this suggests an additional penalty for using coal over natural gas for the generation of electricity not included in our analysis”. They address the electrical comparison in an electronic supplement table, however they do so there on the basis of a 20 year GWP and they minimize the efficiency differential between gas and coal by citing a broad range for each rather than emphasizing the likelihood that efficient gas plants will replace inefficient coal plants. Had they used a 100 year GWP and their low-end 3.6% methane leakage rate, shale gas would have about half the impact of surface coal when used to generate electricity (assuming an electricity conversion efficiency of 60% for gas and their high 37% conversion efficiency for coal). The electric industry has a large stock of old, inefficient coal-fired electric generating plants that could be considered for replacement by natural gas (Table 1 in EIA AEO 2011). The much lower construction costs associated with gas power plants (e.g. Kaplan 2008) means modern gas technology will likely replace this old coal technology as it is retired. If total (well drilling to delivery) leakage is limited to less than 2% (which may be the current situation and, in any case, seems well within the capabilities of modern technology; EPA 2007, 2009), switching from coal to natural gas would dramatically reduce the greenhouse impact of electricity generation. Minimizing this point by stressing extreme rather than likely scenarios is perhaps the most misleading aspect of the Howarth et al. analysis. Figure 1 depicts what we suggest is a more representative comparison of the likely impact on greenhouse gas emissions when natural gas replaces coal in older coal-burning electric power plants. In our analysis, we assume 60% efficiency for natural gas generation of electricity, 30% efficiency for coal generation of electricity in older plants, and a total methane leakage rate of 2.2%. Relatively low-cost 60% efficient generators using natural gas are commonly available (Siemens). When both fuels are used to produce electricity (MJe), the greenhouse impact of natural gas is only as bad as coal if a very high methane leakage rate of 7.9% and a short global warming impact period of 20 years are selected (column labeled Howarth et al. in Fig. 1). If the comparison is based on the heat content of the fuels, the top (green) portion of the Howarth et al. column is doubled in length, and gas becomes twice as bad as coal from a greenhouse perspective. This is the basis of Howarth et al.’s suggestion that gas could be as bad or twice as bad as coal from a greenhouse perspective. Assuming more realistic estimates of gas leakage rates and using the 100 year global warming potential factor (of 33 g of GHG-equivalent CO2 per gram of methane released to the atmosphere), which captures the contrast in atmospheric lifetimes of CO2 and natural gas, we show in Fig. 1 that gas has a much smaller global warming impact than coal. For leakage rates less than 2%, the impact of natural gas approaches one third that of coal, and methane leakage (top green bar) is an insignificant part of the greenhouse forcing compared to the CO2 released during combustion (bottom blue part of bar). For the 100y GWP of 33, gas exceeds the global warming impact of deep coal only when its leakage rate exceeds 18.2% of production, and exceeds the global warming impact of surface coal only when its leakage exceeds 17.1% of production. These natural gas leakage rates are well beyond any known estimates. If the fuels are compared just on the basis of heat (i.e. disregarding efficiency of use), gas has a lower greenhouse impact than coal if the leakage is <5.5% for a 100 year GWP, and if the leakage is <2% for a 20 year GWP. Comparison of the greenhouse impact of burning natural gas to coal when the fuels are used to produce electricity, expressed as the grams of GHG-equivalent CO2 carbon per megajoule of electricity generated. The conversion efficiency to electricity of coal and gas are assumed to be 30 and 60% respectively in all columns except the 4th and 8th columns, which compare a very efficient coal plant to a less efficient gas plant. As in Howarth et al. (2011) we use 20 and 100 year GWP factors of 105 and 33 g of GHG-equivalent CO2 per gram of methane released, and assume deep and shallow coal mining releases 8.4 m3 and 2.3 m3 methane per ton, respectively. Indicated below each column are the GWP factors, the percent methane leakage (1, 2.2 and 7.9%), whether the coal burned is from deep or shallow mines, and where different from 60%, the gas conversions efficiency used in the calculation. No allowance is made for the transport/transmission of either fuel, which effectively assumes electricity generation at the well/mine head. Shale gas is generally closer to power markets than coal, however. Column 4 in Fig. 1 makes more favorable assumptions regarding the use of coal. Here we compute the greenhouse impact of producing electricity in an ultra-supercritical pulverized coal unit without CO2 capture (which would reduce its conversion efficiency) of 62 gC/MJe. A 2007 interdisciplinary MIT study found that a plant of this nature might achieve a 43.3% conversion efficiency when burning low impurity coal (MIT 2007). Although no plant of this kind has yet been constructed, the 4th column in the gas category of Fig. 1 shows that the greenhouse impact of a gas plant with 50% conversion efficiency would have about half the GHG impact of this high-end coal plant. Sixty percent conversion efficiency is not the limit for gas. Combined heat and power (CHP) generation can utilize 90% of the chemical energy in gas. Heat could be likewise used from coal facilities, but small gas units are more cost effective and gas facilities could be built closer to populated user markets that could utilize the heat. Thus gas has a greater CHP potential than coal. A critical part of Howarth et al.’s paper’s contention that shale gas has a larger greenhouse impact than conventional gas is the contention that an unconventional gas well vents 1.9% of its lifetime gas production during well completion. (Unconventional gas wells include those producing from tight sands, shales, and coal bed methane wells—the Howarth et al. figures assume that emissions from these are all similar.) This is dramatically more than the 0.01% they cite as vented by a conventional gas well. Their 1.9% number is a large component in their high-end leakage rates, which are themselves central to their contention that the global warming impact of gas could be twice as bad as coal on a heat content basis. We agree with Howarth et al. that the available data are extremely limited, that their analysis relies heavily on powerpoint presentations rather than values published in reviewed literature, and that there is an obvious need for better estimates. However, given the lack of quality data, we feel that the authors have a responsibility to make explicit the nature and limitations of such sources, and to be especially clear on the assumptions made in their interpretation of such data. We feel that was not done, and offer the following to put their estimates in context. The numbers they use to represent fugitive emissions for the Haynesville Shale cannot be found in the references they cite. That the daily methane loss estimates shown in their Table 1 are close to the initial production (IP) values cited in their references suggests that the authors assume that the latter is somehow an estimate of the former. As argued below and in the electronic supplement, this is incompatible with (a) the basic physics of gas production, (b) the economic incentives of gas production, and (c) the only early production data related to shale gas that can be found amongst any of their references. The only discussion of methane losses during well completion is found in the citations for tight gas sands, and those values are presented to illustrate how currently used technologies can capture most (up to 99%; Bracken 2008) of those “losses” for sale. Their estimate of methane loss from drill out is based on two numbers from the Piceance Basin reported in a powerpoint slide presented to an EPA Gas STAR conference (EPA 2007). They assume that 10 million cubic feet of gas is typically vented during well drill out rather than being captured or flared, although their source makes no such claim. For reasons discussed below and in the electronic supplement, gas production is rare during drill out and if significant gas were produced during drill out it would not be emitted into the atmosphere for economic and safety reasons. The magnitude of the releases they suggest are not credible when placed in the context of well completion and well pad operating procedures, safety, and economic factors. The high releases of methane Howarth et al. suggest for the Haynesville data in their Table 1 are the most problematic because they skew the average for the suite of locations listed, and because the numbers are not based on documented releases to the atmosphere but rather on initial production rates that may well have been captured and sold or flared. The value shown in their Table 1 for methane emitted during flowback in the Haynesville does not exist in any of their citations. The reference linked to this number (Eckhardt et al. 2009) is an online industry scout report on various values of flow tests and initial production (IP). To the extent that this reference deals with the fate of the gas associated with those flow tests it indicates that the production was captured and sold. The estimate for IP for the Haynesville is based on another informal, unvetted, web posting by a gas producer that is no longer available. However that estimate of IP is consistent with the values cited in Eckhardt et al. and the known characteristics of Haynesville wells. The fact their values for the daily rate of “lost” emissions for the Haynesville are virtually identical to the IP values for the wells indicates that the authors believe or assume that: (a) a well produces gas during completion at a rate that is equal to the highest rate reported for the well (the IP rate), and (b) that this gas is vented directly to the atmosphere. They provide no documentation for either of these beliefs/assumptions, which are on multiple grounds illogical. Because initial production is the highest flow achievable, and flowback occurs when the well still contains substantial water, flowback gas recoveries cannot exceed initial production recoveries, although Howarth et al. imply this is the case for all the areas listed in their Table 1. The problem is this: High gas flow rates are not possible when the well is substantially full of water, as it usually is during the flowback period. Gas cannot move up a wellbore filled with water other than in isolated packets, and it can flow optimally only when enough water is removed for the gas to have a connected pathway of gas up the well to the surface. Unless otherwise explicitly noted, initial production figures are published to show the highest recorded production rate for each well. They are a benchmark that characterizes what optimal production rate can be achieved by a well (and for which there is every incentive for producers to exaggerate in order to attract investors: http://www.oilempire.us/shalegas.html). These initial production tests are seldom run until after any substantial water has been removed from the well because substantial water impedes the outflow of gas. The only sources which explicitly provide estimates of gas production during completion are for the Barnett (EPA 2004; although the Barnett is not named in this reference), the Piceance (EPA 2007), the Uinta (Samuels 2010), and the Den Jules (Bracken 2008) gas sands. These references report how gas production was recovered for sales and imply that this has been the case (at least for these companies) for several years! They emphasize the strong economic incentives for gas producers to capture and sell completion gases rather than flare or vent them. Only one (EPA 2007) provides explicit measurements of both captured (with “green technology”) and lost emissions, and these numbers indicate a loss rate of 0.1% of total production. Howarth et al. cite the gas capture numbers in these references as representative of the gas leakage into the atmosphere that would occur if the gas was neither captured nor flared. They assume that this is the common situation, but do not make it clear that they have made this assumption. Rather they buttress their leakage estimates with the citations as if the latter explicitly documented methane leakage into the atmosphere, which they do not. Based on Howarth et al’s own references, as confirmed by conversations we have had with people experienced in well completions, we believe the losses during drill out and well completion for unconventional shale gas wells are not significantly greater than those cited by Howarth et al. for conventional gas wells. Certainly this could be made to be the case. This is supported by some of the examples cited by the EPA and Howarth et al. The Williams Corp (EPA 2007, p 14) shows, for example, that >90% of the flowback gas is captured and some of the remainder flared (George 2011, p14). If this were generally the case Howarth et al.’s 1.9% leakage would be reduced to 0.2%. An alternative life cycle analysis of a natural gas combined cycle power plant shows the total methane release from unconventional Barnett Shale hydrofractured gas wells is within a few percent of that from conventional onshore gas wells (DOE/NETL 2010, Table 5.1 and Figure 5.1). The leakage during drill out and well completion could be legislated to near zero by legally requiring flaring. It is also worth pointing out that much of the oil produced in the United States at present is either from hydrofractured wells or shale formations, and thus is unconventional oil. Almost every conventional and unconventional oil well also produces natural gas. A clean distinction between “conventional” and “unconventional” gas production, and between “oil” and “gas” wells, thus may be very difficult to make, as there is an enormous amount of overlap between these categories. Additional material supporting the statements made above is provided in an electronic supplement to this commentary. We describe there what happens when a well is completed and brought into production, and explain why a well cannot vent at its IP rate during the early drill out and completion phases, and (with discussion and a figure) why Howarth et al.’s projection of the IP rate to the flowback stage (these early stages) of well development is inappropriate. We discuss the purpose and nature of a scout report and show that the scout report cited by Howarth et al. states that the reported gas production was captured and diverted to sales (not vented into the atmosphere as Howarth et al. imply). We discuss the safety implications of Howarth et al.’s contention that 3.2% of the total eventual production of a shale gas well is vented into the atmosphere over a period of ~10 days, and show that this represents $1,000,000 worth of gas and presents a fire/explosion hazard that no company would countenance. And we show that the EPA’s suggestion of release rates 50% of Howarth et al.’s is based on the assumption that, where capture or flaring is not required by law, methane is released to the atmosphere—an assumption that is not warranted on current practice, economic, or safety grounds. Those not familiar with well completion and production or economic and safety well procedures may find this additional material useful. The leakage that occurs between an operating well and consumers as the result of gas handling, processing, storage, and distribution is the same whether the well is producing from tight shale or conventional source rock. These losses are very hard to measure as they rely on a variety of sources that cannot be controlled in a scientific fashion. As well as true leakage you have to deal with questions of metering accuracy, shrinkage due to removal of higher order hydrocarbons, fuel use by compressors along the pipeline, etc. Trying to reach an estimate is important because various parties have a financial interest in the gas as it travels to the consumer, but scientific assessments are also encumbered by accounting conventions that relate to how gas transmission is charged to pipeline users. The results of most studies should not be considered accurate estimates that can be used for climate studies. With well completion and drill out losses from both sources negligibly small (see above), the range of methane emissions that Howarth et al. identify is from 1.7 to 6% of total production. Leaking 6% of the gas that will ultimately be produced into the atmosphere during on-site handling, transmission through pipelines, and delivery appears to be far too high and at odds with previous studies. The most recent comprehensive study (EPA 2011, Table 3–37, assuming a 2009 U.S. production of natural gas of 24 TCF) shows the emission of methane between source and user is ~2.2% of production. Breaking this down, 1.3% occurs at the well site, 0.73% during transmission, storage, and distribution, and 0.17% during processing. The EPA Natural Gas STAR program (EPA 2009), a voluntary partnership to encourage oil and natural gas companies to adopt best practices, reports methane emissions of 308 BCF in 2008 This represents an emission of ~1.3% of total production. A life cycle analysis of combined cycle natural gas power pollutants suggests leakage can be much smaller. This report estimates ~0.9 wt.% leakage of methane between source and consumer (DOE/NETL 2010, Table 5.1), and suggests what best practices might achieve. A reasonable range for methane emissions to the atmosphere between source and consumer in the U.S. (the proper subject of the current discussion) would thus appear to be between 0.9 and 2.2% of production. Excepting completion and drill out losses, the losses during transmission, storage and distribution, which Howarth et al. claim are conservatively 1.4–3.6% of production, constitute the largest fraction of their range of total gas losses of 1.7–6%. Howarth et al.’s transmission, storage and distribution losses are 2–5 time higher than the EPA (2011) estimate of 0.73%. Even their low end estimate seems far too high. Furthermore, many organizations have addressed these leakages, and many are striving to reduce them. Even if a 6% leakage rate were true in the US, the obvious policy implication would surely be to “fix the leaks”. For example, Russian leakage was huge in the 1980s but with recent investments and improvements their leakage rate now is comparable to and perhaps less than ours. Of all the possibilities one could think of, reducing methane leakage should be the easiest, most accessible, and least costly way to reduce greenhouse gas emissions, and something that should be done regardless of how a comparison of gas and coal turns out. We have highlighted key aspects of the recent letter from Howarth et al. that we believe are misleading. The first aspect is the question of just how much methane gets released directly into the atmosphere during drilling, production, and transmission from unconventional gas wells. We show that the authors base their leakage rates heavily on two assumptions: (1) that drillers vent gas to the atmosphere during the drill out and pre-IP stages of development rather than capture and divert it to sales or flare it, and (2) that the discharge rate during these periods is comparable to the maximum production rate the well will experience—the IP rate. Absent very specific documentation, which Howarth et al do not offer, we can find no reasons to suspect that it is current industry practice to vent gas during these periods at the extreme rates and quantities Howarth et al. suggest, and we find obvious economic and safety reasons that this would not be industry practice. Howarth et al.’s assessment of the leakage from shale gas production appears to be too large by a factor of ~10 (0.2% of lifetime production rather than the 1.9% Howarth et al. assume). Even if we were to accept their estimate as representative of current practice (which we believe it is not), it is clear from Howarth et al.’s own citations that there are existing technological options that can greatly reduce such losses, and future technological improvements are sure to further reduce losses venting from both conventional and unconventional wells. The second aspect of the Howarth et al. paper that we question is the effect of methane leakage from gas drilling on greenhouse gases and the future climate. Howarth et al. compute the GHG impacts using the most unfavorable time period (20 years vs 100 years) and basis (heat vs electricity) for comparing gas with coal. Considering that coal is used almost exclusively for generating electricity, gas must replace electricity generation by coal and the fuels should be compared on this basis. When considering the impact of swapping methane for CO2 it is important to take into account the very short lifetime of methane in the atmosphere compared to the very long lifetime of the CO2. The 100 year GWP for methane does this, the 20 year GWP does not. Focusing on electricity generation and using a 100 year GWP we show, using the same methods as Howarth et al., that gas has less than half and perhaps a third the greenhouse impact as coal. Since gas also possesses other important emission advantages such as no particulates, SO2, NO2, or ash, it is clearly the “cleaner” option in comparison to coal. Howarth et al. arrive at their conclusion that gas could have twice the greenhouse impact as coal only by using fugitive gas emissions 3.6 times larger than is reasonable (e.g. 2.2%), selecting a 20 year Global Warming Potential period for methane (which confers an impact 3.2 times bigger than a 100 year GWP), and failing to consider that a modern gas plant can generate electricity nearly twice as efficiently (and therefore with half the GHG input) as old coal plants. It is of course possible, although we consider it highly unlikely and find no evidence to that effect, that methane emissions from wells and pipelines might be as large as Howarth et al. aver. But, as they acknowledge, these leaks could be economically and relatively easily fixed. Addressing whatever deficits natural gas might have at present so that it realizes the potential GHG benefits that are indicated in our Fig. 1 seems to us a goal eminently more achievable with current technology, and should be far more economic and less risky than relying on undeveloped and unproven new technologies to achieve the same degree of GHG reduction through other methods. Surely we need to consider how to reduce GHG emissions for all fuels, and should do the best we can with all the fuels we are using and are likely to continue using for some time. But in the short term, our energy needs should be satisfied mainly by those fuels having the fewest inherent environmental disadvantages, and we believe those preferred fuels include natural gas.